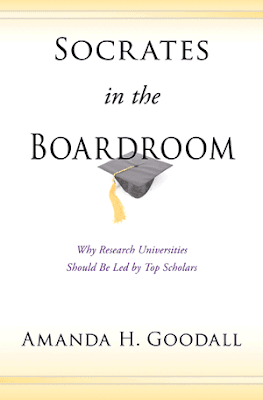 Socrates in the Boardroom argues that world-class scholars, not administrators, make the best leaders of research universities. Amanda Goodall cuts through the rhetoric and misinformation swirling around this contentious issue--such as the assertion that academics simply don't have the managerial expertise needed to head the world's leading schools--using hard evidence and careful, dispassionate analysis. She shows precisely why experts need leaders who are experts like themselves. Goodall draws from the latest data on the world's premier research universities along with in-depth interviews with top university leaders both past and present, including University of Pennsylvania President Amy Gutmann; Derek Bok and Lawrence Summers, former presidents of Harvard University; John Hood, former vice chancellor of the University of Oxford; Cornell University President David Skorton; and many others. Goodall explains why the most effective leaders are those who have deep expertise in what their organizations actually do. Her findings carry broad implications for the management of higher education, and she demonstrates that the same fundamental principle holds true for other important business sectors as well. Experts, not managers, make the best leaders. Read Socrates in the Boardroom and learn why. Amanda H. Goodall is a Leverhulme Fellow at Warwick Business School at the University of Warwick.